In 1779, the Cosford Hundred and parish of Polstead were incorporated under a local Act For the better Relief and Employment of the Poor of the several Parishes within the Hundred of Cosford (except the Parish of Hadleigh), and also of the Parish of Polsted, within the Hundred of Babergh, in the County of Suffolk (19 Geo.3 c.30). In 1780, a House of Industry was built at Semer at a cost of about £8,000. The main building had a U-shaped layout like the other Suffolk Hundred workhouses of the period at Tattingstone and Oulton. The inmates were chiefly employed in spinning yarn for Norwich. The workhouse had its own burial ground and a "pest house" where those with infectious diseases such as the plague or smallpox were isolated. 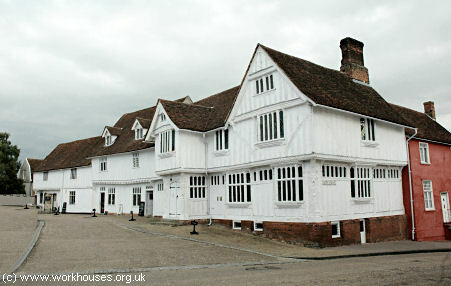 A workhouse once operated in a building known as the Guildhall (once the hall of the Guild of Corpus Christi) at the south-east side of the Market Place in Lavenham. A bridewell or prison was also located in the premises. 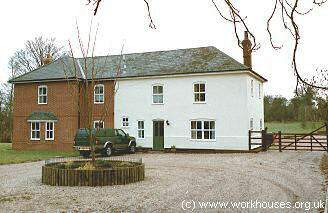 Lavenham former parish workhouse, 2006. County of Suffolk: Aldham, Bildeston (2), Boxford (2), Brent Eleigh, Brettenham, Chellesworth, Cockfield (2), Edwardstone, Elmsett, Groton, Hadleigh Hamlet, Hadleigh Parish (3), Hitcham (2), Kersey, Kettlebaston, Lavenham (2), Layham, Lindsey, Milden, Monk's Eleigh, Naughton, Nedging, Polstead (2), Preston, Semer, Thorp Morieux, Wattesham, Whatfield. The population falling within the Union at the 1831 census had been 17,900 with parishes ranging in size from Milden (population 177) to Hadleigh Parish (3,425). The average annual poor-rate expenditure for the period 1831-34 had been £19,223 or £1.1s.6d. per head of the population. In 1836, the new Cosford Union took over the existing parish workhouse at Semer and the Poor Law Commissioners authorized the sum of £1,402 for its adapatation to meet the segregation requirements of the 1834 Act. This included the erection of additional yard walls and the blocking of inter-communicating doorways. The workhouse location and layout are shown on the 1882 map below. Cosford from the south, c.1905. A chapel was built to the east of the workhouse in 1859 at a cost of £350 of which £200 was raised by subscriptions. An isolation hospital was erected to the north of the workhouse in 1869-70 at a cost of £900. Ten acres of land surrounded the workhouse, much of which was cultivated by the inmates. The workhouse closed on 31 March 1923. Little now survives of the buildings. A house on the site incorporates a small block from the north-east corner of the workhouse. Cosford from the east (original building painted white), 2001. The former isolation hospital is now in occupied as a private house. 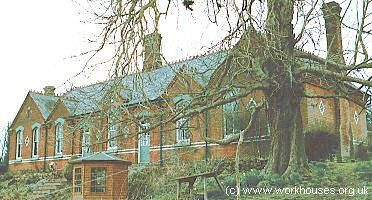 Cosford isolation hospital from the south-east, 2001. Suffolk Record Office, 77 Raingate Street, Bury St Edmunds IP33 2AR. Relatively few records survive. Main holdings are: Guardians' minute books (1835-1930); Bastardy orders (1849-60); Settlement papers (1825-81); Apprenticeship indentures (1852-72).